PT Hanjaya Mandala Sampoerna Tbk - PT HM Sampoerna Tbk (IDX:HMSP) or referred to as "HM Sampoerna" is one of the largest tobacco producers in Indonesia. HM Sampoerna controls about 35% market shares in the domestic tobacco market as at the end of December 2015. Sampoerna is a local subsidiary company of Philip Morris International Inc (PMI Group), one of the largest tobacco companies in the world. As of December 2015, PMI Group holds 92.75% shares in Sampoerna through PT Phillip Morris Indonesia. Other 7.25% remaining shares in HM Sampoerna was owned by the public. 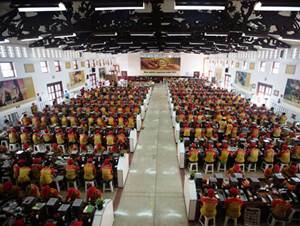 HM Sampoerna is domicled in Surabaya East Java and now runs its business through 7 manufacturing facilities. HM Sampoerna also supported by 38 Third Party Operators (TPOs) throughout Java. In 2015, HM Sampoerna posted positive financial performance. According to HM Sampoerna Annual Report 2015 as cited by JobsCDC.com, HM Sampoerna reported total net sales of Rp 89,069 billion in 2015. This reflected an 10.38% increase from Rp 80,690 billion in 2014. University degree (S1), majoring in Marketing, Communication, Public Relation (PR), and Journalism. Involvement in digital creative industry, millennials' communities, and movie / publishing companies will be highly prioritized. At least 2 years of experience in brand marketing / digital content making / publishing. Demonstrate excellent taste on creating or curating multiple types of content, and are well connected to various communities / media. The candidate with prior experience in media (magazines, digital portal), brand and creative agency is preferred. Previous experience of market research and branding guidelines and strategies. JobsCDC.com now available on android device. Download now on Google Play here. Please be aware of recruitment fraud. The entire stage of this selection process is free of charge. PT HM Sampoerna Tbk - Recruitment Digital Content Executive Sampoerna June 2016 will never ask for fees or upfront payments for any purposes during the recruitment process such as transportation and accommodation.